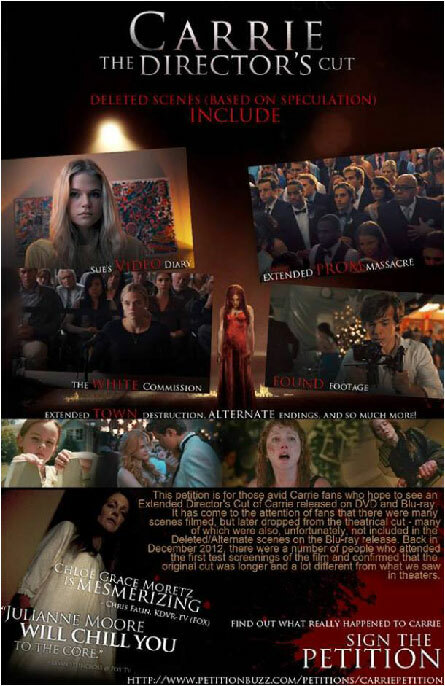 Did you happen to see the 2013 re-boot of Carrie starring Chloë Grace Moretz as the telekinetic troubled teen who uses her mind powers to burn down her high school, thereby frying to a golden crisp everybody in it? I’m here to ruin your day – you didn’t see all of it. Ha! 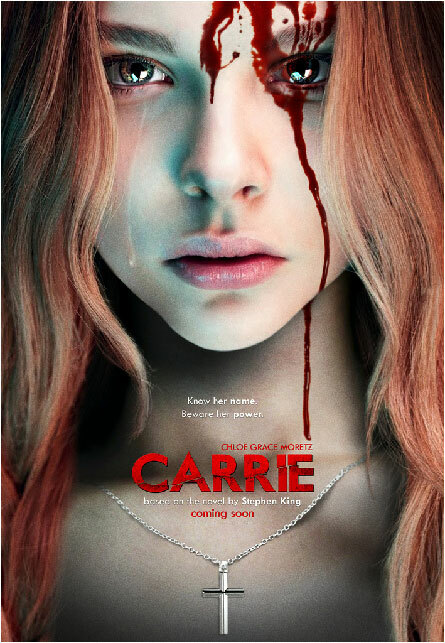 There was 40+ minutes cut, most of which played out Carrie’s destruction in more graphic detail. According to Petitionbuzz.com, fans of the movie have rallied and are demanding the Blu-ray and DVD have the entire movie reinstated, with all the deleted and cut scenes put back where they belong. If you agree – and you should – click HERE to sign the petition to make it happen. They need 20,000 signatures; as of today they have over 11,000. Sign the petition nine thousand times and let’s get this party started. This petition is for those avid Carrie fans who hope to see an Extended Director’s Cut of Carrie released on DVD and Blu-ray. It has come to the attention of fans that there were many scenes filmed, but later dropped from the theatrical cut – many of which were also, unfortunately, not included in the Deleted/Alternate scenes on the Blu-ray release. Click the link to see details of all the deletions and whip out your i-pen and sign that thing. A couple of upcoming new ones that look old. But they’re not. They’re new. For reals. 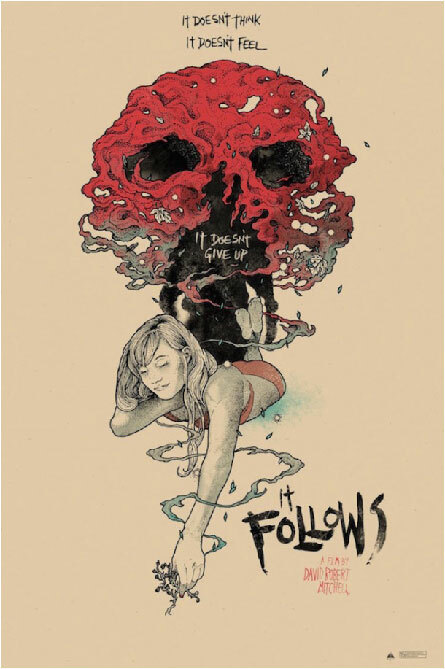 First up is It Follows, due out March 13, 2015, probably before lunch, but definitely after breakfast. It involves a young girl who is plagued by nightmarish visions after an “innocent sexual encounter” in the back seat of a car. OK, no sexual encounters are innocent. That’s what organized religion tries to drill into our horn dog brains. Secondly, who hasn’t had nightmarish visions after hooking up? Think Lair of the White Worm (1988) and go from there. ANYWAY…after said hook up, 19-year-old Jay (chick with a dude’s name) can’t shake the sensation that someone – or something – is following her. As the threat closes in, Jay and her friends must somehow escape the horrors that are only a few steps behind. I bet it’s organized religion. “It’s Halloween 1989. Best friends Sam and Josh are trying to enjoy what’s left of their final Devil’s Night before graduating high school. 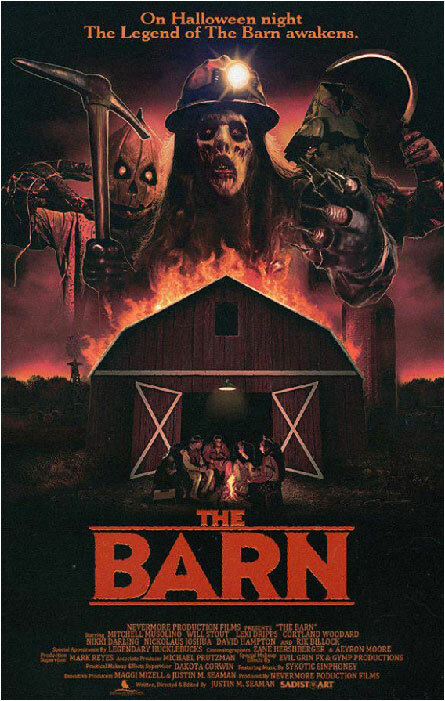 But trouble arises when the two pals and a group of friends take a detour on their way to a rock concert, finding an old abandoned barn and awakening the evil inside. Could this be the Old MacDonald version of Night of the Demons (1988)? I will ponder that over a nice breakfast of barn eggs, barn sausage and horse apples. OK, probably not that last one.